Healthy Hamburger and Fries even Strawberry Shortcake! Usually when you have a burger and fries it isn’t the healthiest choice. It tends to be a high calorie, high fat meal that will put a lot of stress on your body. But it doesn’t have to be that way. Over the Holiday weekend we made a great meal of burgers, fries, grilled vegetables and even a Light Old-Fashioned Strawberry Short Cake. I will share with you what we did. For the burgers we used bison burgers that we bought at Costco. These are Bison that graze on wild grasses – not your typical grain fed meat. Meat that is grass fed is much healthier than grain fed. If we buy red meat, this is what I look for: organic and grass fed. Instead of using a bun we used a LaTortilla Factory Smart and Delicious Tortilla. These are high in fiber and protein and only 80 calories for a large tortilla (half a hamburger bun is 80 calories). It also holds all our favorite burger toppings well. If you slice up the burger before you put it on, you’ve got a great wrap! We also added a slice of reduced fat Swiss cheese. Toppings included onion, tomato, lettuce, avocado and spicy mustard. Making healthy fries is easy. We cut up russet potatoes in thin slices, like a typical French fry. Tossed them with a little olive oil, see salt and garlic powder and bake them in a 425 degree oven for about 30 minutes or until they start to brown. At the hardware stores you can find various grill accessories to use on your grill for cooking things like vegetables or seafood. The one we have looks like a square colander. We grilled asparagus, peppers, onion and zucchini drizzled with a little olive oil. Season with salt and pepper and grill for about 15 minutes. Nels starts it on high and reduces the heat to medium. Spritz with some Bragg’s Liquid Amino Acids when done cooking for a little extra flavor. 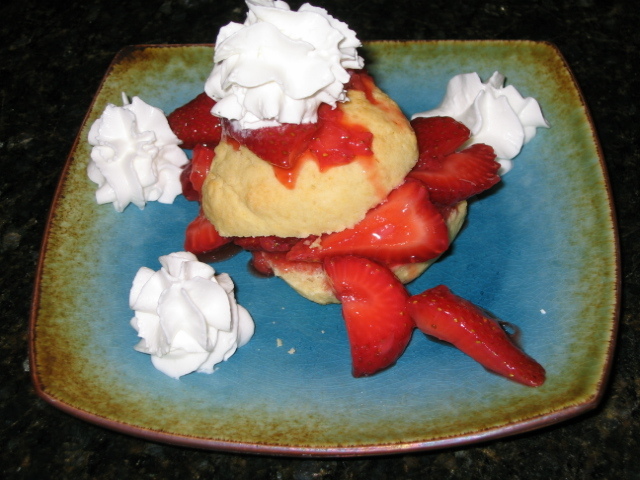 For dessert I made an Old –Fashioned Strawberry Shortcake. I found this recipe on the Cooking Light web site – it came from myrecipes.com. It was delicious! I modified the recipe a little. I used more strawberries and only ¼ cup of sugar with them and no orange juice. I did add an additional table spoon of buttery spread to the flour mixture(earth balance organic buttery spread) because the flour mixture was not resembling coarse meal. This would be great even without the whipped topping. Once you get used to eating healthy, eating an unhealthy alternative loses its once oh so good taste and you actually prefer healthy foods! Caloric cost of sampling at Costco!